Bahia del Sol Beach Front Boutique Hotel is just a few steps from the tranquil waters of Potrero Beach on the Northwest Pacific coast convenient to Flamingo Beach. With a commitment to sustainability, Bahia del Sol Beach Front Boutique Hotel balances nature and the traditions of the local community. The friendly staff welcomes you and invites you to enjoy the amenities and participate in free yoga classes that will center you and put you in harmony with your tropical surroundings. The large pool, tropical gardens and grassy lawn stretch to connect you directly to the beach. Simply paradise. Sattva Yoga to balance body, breathing and mind is a fusion of Hatha and Raja Yoga. Each class focuses on alignment, breathing, posture and meditation. 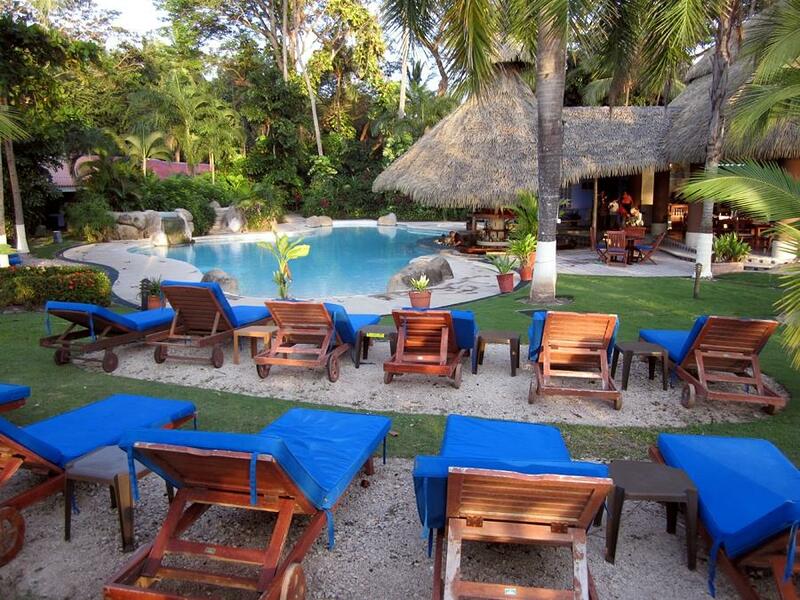 Taught by certified instructors in the Palapa just in front of the beach to enjoy sea breeze and ocean sounds. Yoga classes are offered each morning from 8:30-9:45 and is free to all guests. There is a charge for other area participants. Wellness Spa offers specialized treatments to pamper guests. Open air Nasu Restaurant’s serves traditional Costa Rican dishes or sophisticated international gourmet creations and fresh seafood served with a tropical touch with spectacular ocean views and the relaxing sound of peaceful lapping waves. Palapa Lounge overlooks the beautiful Catalinas Islands where you can enjoy spectacular, colorful sunsets while enjoying a tasty concoction. Standard and Deluxe rooms have 1-2 beds with private bathroom, Wi-Fi, A/C, TV, mini-bar, coffee maker, safe, telephone and hairdryer. Suites and Family Suites available with touches like a private patio with open air Jacuzzi tub, private bathroom that opens to outdoor shower and private terrace that flows onto beach just steps from your room. Bahia del Sol Beach Front Boutique Hotel Costa Rica with Bill Beard’s scuba diving, vacation planners and adventure travel company since 1970All rooms offer Wi-Fi, A/C, TV, mini-bar, coffee maker, safe, hot water and hairdryer. HOTEL AMENITIES: Parking, Yoga Center, Swimming Pool with Tiki Bar, jacuzzi, spa, On Site Restaurant, Free Wi-Fi. Open air Nasu Restaurant (6:30 am-10 pm) serves traditional fare, plus gourmet dishes fresh from the ocean and tropical beachfront ambiance with spectacular ocean views and the sound of peaceful lapping waves. Palapa Lounge (5:30 pm-9 pm) overlooks the beautiful Catalinas Islands where you can enjoy spectacular, colorful sunsets while enjoying a tasty drink. A fine selection of wines, beers, liquors and fresh tropical fruit beverages. Standard Rooms (Sleeps 2): Non-smoking rooms have either one Queen Bed bed, desk, private bathroom, Wi-Fi, A/C, TV, mini-bar, coffee maker, safe, telephone and hairdryer. Standard Rooms with 2 beds (Sleeps 3): Non-smoking rooms have two full size beds or two queen beds, desk, private bathroom, Wi-Fi, A/C, TV, mini-bar, coffee maker, safe, telephone and hairdryer. Private patio with open air Jacuzzi tub, Hammocks in the corridor with garden view. Deluxe Rooms with 1 King bed (Sleeps 2): Non-smoking rooms have two full size beds or two queen beds, desk, private bathroom, Wi-Fi, A/C, TV, mini-bar, coffee maker, safe, telephone and hairdryer. Hammocks in the corridor with garden view. Bahia del Col beach front hotel Costa Rica with Bill Beard’sDeluxe Superior (Sleeps 3): Non-smoking rooms have a King sized bed and one sofa bed, shower, bathtub, Wi-Fi, A/C, TV, mini-bar, coffee maker, safe, telephone and hairdryer. Family Suite (Sleeps 5): Non-smoking suite has two rooms, main room has a Queen bed and private bath, second room has two twin beds and private bath. Living and dining areas, fully equipped kitchen. Breakfast bar and living room furniture, Wi-Fi, A/C, TV, mini-bar, coffee maker, safe, hot water and hairdryer. King Sun or Honeymoon Suite (Sleeps 2): Non-smoking suites have King sized bed, desk and living room furniture, Wi-Fi, A/C, TV, mini-bar, coffee maker, safe, hot water and hairdryer. Private patio with open air Jacuzzi tub, private bathroom that opens to outdoor shower, private terrace that flows onto beach just steps away.